Restivo’s Heating and Air Conditioning was recently featured in an episode of This Old House. The project was located in Jamestown and Restivo’s was in charge of installing the heating and cooling system for the home. The system of choice was a LG Heat Recovery Unit, which heats, cools, and recovers heating from the cooling system to save energy. The system is so advanced that it can simultaneously heat while cooling to provide comfort throughout the entire house. Nick Restivo was on site doing the work and is featured in the episode. The project wraps up in This Old House Episodes 11, 12 and 13. Episode 13 premiers on 2/8/19, and we are excited to see the project come together! Here’s the full synopsis of the This Old House Episode 11, where Restivo’s team was first introduced in the project. Click on the title to watch the full episode. The show opens with Kevin at the busy Jamestown job site where the yard has been ripped up from the heavy machinery. In just a couple short weeks the grass will go in but luckily Roger has a good solution. Roger joins Jenn and Kevin at a nearby sod farm where hundreds of acres of environmentally friendly grass is grown. They learn about a variety with micro clover that requires less water and uses no pesticides and fertilizer. Soon pallets of rolled up sod will be delivered to the project for a nice green lawn. Back at the house, the new HVAC equipment is on site. Behind the barn Richard shows the outdoor heat recovery unit, which can simultaneously heat and cool the home. In the basement is a zoning box, the brain of the system, which determines whether heat should be sent back outside or be reused in one of the five house zones and the hot water tank. Upstairs in the living room, Jeff and his fireplace installer move a direct vent high efficiency fireplace into the framed chase. A television will eventually be mounted above the fireplace, so there’s a heat release system that will vent inside of the chase to keep the hot air away from the tv. The wood framed porch gets screened in the old fashion way. Tommy works with Jeff to staple black fiberglass screens to a wooden piece that slides into an opening created by the framing. Back outside, Richard watches as high- pressured water is pumped into the newly dug well to create a better water flow. Since water usage is often restricted in Jamestown, the water that’s accessible by this well will be pumped to a tank to be used in the summer for irrigation. 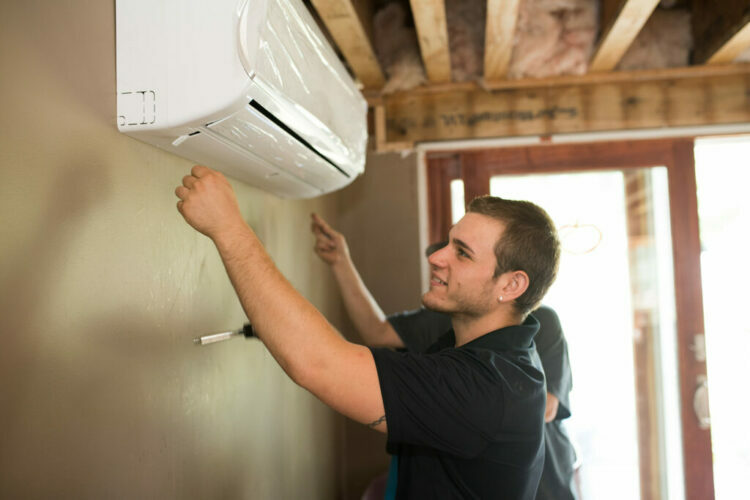 Whether your home is old, new or anything in between, the Restivo’s team has a myriad of tools to provide the most advanced energy efficient heating and cooling for your home’s unique needs. Contact us today for a free quote.